Calboccia is located on the border of Umbria and Tuscany. The small valley below us is in Tuscany, while our home, on one side of the valley, as well as the hills on the other side of the valley, are in Umbria. 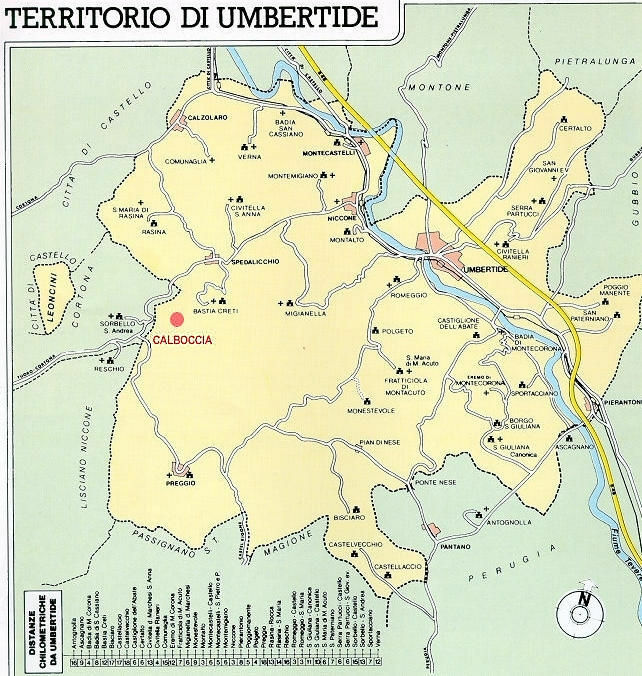 This makes our location uniquely convenient for visiting the hill-towns of both Umbria and Tuscany. Of historical interest is that we have found evidence on the property that the site was occupied by Romans in early A.D. times. Our family gets to Calboccia by flying to Florence, via Paris, Munich or Frankfurt; or by flying to Rome via London, Amsterdam, Zurich, or New York. The driving distance from the Rome airport to Calboccia is about 3 hours, from the Florence airport about 2 hours and 15 minutes, and from the Milan airport approximately 5 hours. The train station most convenient to Calboccia is in Terontola/Cortona, which is on the main north-south line in Italy, and therefore provides easy access not only to Rome and Florence, but to connections throughout Europe. Depending on the time and class of train taken, Rome can be reached in as little as 1:45 and Florence in just over an hour. Terontola is about 45 minutes away from Calboccia.